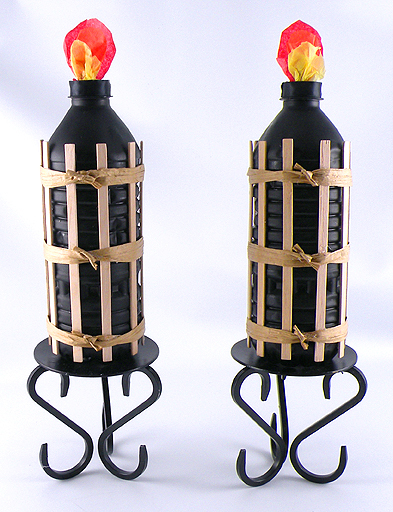 I love using tiki torches, they add instant charm to any barbecue. I was planning my Labor Day cookout and I thought why not make a version that can be used inside as a table decoration. I still wanted to have the look of a lit tiki torch even if it was rainy outside and I also wanted the people sitting inside have the feeling of being outdoors. This is an inexpensive and easy to create project and some of the materials you may already have around your house. This entry was posted in Crafts, Everything, Recycle, Uncategorized and tagged barbeque, cookout, Gina Tepper, labor day, luau, recycle, reuse, Tiki Torches, water bottles. Bookmark the permalink.